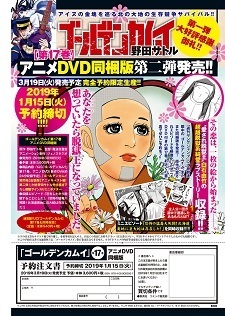 The 51st issue of this year's Young Jump magazine announced on Thursday that Satoru Noda's Golden Kamuy manga will receive a second OVA. The 17th compiled volume, which goes on sale on March 19, 2019, will bundle the new episode. Pre-orders for the special edition volume will be accepted through January 15. The first part of the 24-minute episode, "Koi wo shita kara Datsugoku suru Koto ni Shita" (I Escaped Because I Fell in Love), will tell a pure love story featuring the character Shiraishi Yoshitake, also known as the Escape King. The OVA will also contain the "Kyoufu no Moudoku Dai Shitou! Hokkaido Okuchi ni Kyodai Hebi wa Sonzai shita!" (Deadly Battle with Venom! A Massive Serpent Lurks in the Backwoods of Hokkaido!) mini episode, which will adapt the 104th chapter from the 11th volume. The historical adventure manga began serialization in Young Jump in August 2014. Shueisha published the 15th volume on September 19, which included the first OVA episode covering the Barato no Youjinbou (The Bodyguard of Barato) arc. The 16th volume is scheduled for a December 19 release. Golden Kamuy has a cumulative 8.3 million copies of its compiled volumes in print. Produced by Geno Studio, the first anime season aired in Spring 2018, which was simulcast by Crunchyroll. Funimation also streamed a dubbed edition simultaneously. A second season premiered on October 8. Yes more from this animes is welcome. I'm glad they're making the manga parts they're excluding from the main anime as OVAs. There was some good content getting skipped. I still really want to see the first OVA, but can't find it anywhere. It's non-existent as far as I can tell. I wish Crunchyroll would add it to their listing or something.